The following attempts to describe Honda’s 30 years of development of the Gold Wing, from the prototype MI and culminating in the GL1800 that is currently available. It will enable any interested person to assimilate what has gone on in the Honda camp in their bid to create a touring motorcycle that sets the standards that its riders demand. When the Honda engineer Sciochiro Irimajiri headed a team of engineers and designers in December 1972, their mission was to design a machine that would re-establish Honda’s lead in outright performance and sheer prestige. Irimajiri told his colleagues that the new Honda would be recognised and acclaimed as the “King of Motorcycles, the world’s fasted and best grand tourer”. The team came up with the Honda MI, a water-cooled 1470 cc horizontally opposed six cylinder engine, overhead camshaft machine with shaft drive, developing 80 bhp at 6700 rpm and weighing a mere 220 kg. Tests resulted in a 12-second standing start quarter-mile and a top speed of 220 km/h. This was all very well, but it was impossible to obtain a decent riding position with the long engine in a machine with a wheelbase of 148 cm. So it was back to the drawing board and two years later the Honda Gold Wing GL1100 was shown to the public at the Cologne Motorcycle Show in October 1974. This was a water-cooled flat four with belt-driven single overhead camshafts, four carburettors, a displacement of 999 cc which yielded 80 bhp at 7500 rpm. It had a five-speed gearbox, electric start and fuel tank under the seat. The dummy tank housed some of the electrical gear and an emergency kick-start lever, gave access to vital fluids and had a small storage space. In 1975 the GL1000 reached the showrooms. The new arrival was greeted with mixed reaction, with the American press generally giving the Wing more favourable reviews than their European counterparts. On a negative note, only 5 000 Wings were sold in the first year, against a target of 60 000. In 1976 the GL1000 had some cosmetic and mechanical changes and introduced the LTD model which had special cosmetic additions. There were minor changes in 1977. Comstar wheels replaced the wire spoke wheels in 1978 and the kick-start lever was dropped. The 1979 GL1000 sported some instruments on the tank top. The buyers of Gold Wings proved that they wanted to personalise, customise and improve their machines and hence a healthy accessory and replacement parts industry flourished. As Honda chief engineer, Tetsuo Mikami, said: “Competition did not determine GL development. The reaction of customers made it clear to Honda in what direction to take the GL.” As a result, some top-end speed was sacrificed to obtain improvement bottom and mid-range power. A second generation Gold Wings was a direct result of the liaison between American Honda and the Gold Wing Road Riders Association (GWRRA) and so the GL1100 was introduced in 1980, available as the GL1100 or the GL1100 Interstate (DX in Europe), the latter being equipped with top box, panniers and full fairing as standard. The points were replaced with electronic ignition. The bore had been increased to give extra cc and the engine was beefed up to cope with the Interstate’s equipment. Both machines now had air-assisted front and rear suspension, and a ‘king and queen’ seat. Contrary to the first year’s sales of the GL1000, the GL1100’s first year’s production was sold out without satisfying demand. In 1982, the super luxury Aspencade was added to the range. Standard equipment included an on-board compressor, intercom/stereo radio and CB radio. All were optional extras for the other models. Most noticeable on the 1983 model, were the 11 spoke cast-steel wheels, together with improved front forks and a unified braking system. The Aspencade also had a digital liquid crystal instrument panel and a new two-tone seat. Honda rewrote the rules for touring in 1984 when they introduced the 3rd generation of Gold Wings. Intense competition from the rival motorcycle manufacturers played a big role in revamping the Gold Wing. Thus it was by increasing the bore and stroke to give a 1182 cc capacity, the GL1200, Interstate and Aspencade were born. These new models had a redesigned chassis, a smoother running engine and improved passenger room and comfort. The Aspencade’s special features included LCD instruments, a rear light bar and new type sound system. In 1985, after 10 years of marketing the Gold Wings, the GL1200 was dropped, but the Interstate and Aspencade was joined by a top of the line LDT model featuring computerised fuel injection, cruise control, improved sound system and auto leveling rear suspension. There were very few changes in 1986 except that the GL1200 Limited Edition became known as the GL1200 Aspencade SE-I. With the Aspencade SE-I being dropped in 1987, the other two models differ mainly in standard equipment and weight. Listening to what the customer wanted, considering what was technically possible and projecting what the competition was coming up with, led to the 4th generation of the Gold Wings, namely the GL1500 in 1988. This was a 1520 cc horizontally opposed six-cylinder machine that set fresh standards of smoothness, power and silence. The all new chassis redefined the limits of handling and comfort. The V-shaped radiator allowed the engine to be moved forward and the wheelbase was extended by 89 mm to obtain the required legroom. Fuel delivery was reduced to two computer-controlled carburettors mounted on a heated manifold. A lighter flywheel was able to be used because of the naturally smooth power delivery of the six-cylinder engine. The problem of severe engine braking on a closed throttle resulted in the ‘shot air’ system being developed where fresh air is bypassed to the intake during deceleration, thus reducing combustion chamber vacuum enough to prevent abrupt engine braking. The chassis was made 1,5 times stiffer than the GL1200 with the desired rubber engine mounts. The GL1500 has a unique reverse system incorporating the starter motor. The only alteration for the 1989 model, was the removal of the 1500/6 badge from the rear right pannier. For 1990 the GL1500 had both riding and engine improvements and was joined by the top range GL1500 SE which had a host of special features, including a full logic sound system. Basically unchanged for 1991, the GL1500 SE was joined by two other models. The Aspencade took on the role of the GL1500 and the Interstate became 88 kg lighter and with a 20 mm lower seat height. 1992 saw an upgrading of the sound system for the Interstate. All three models in 1993 now have needle bearings for their rocker arms and the SE and Aspencade’s cruise control now reads directly off the crankshaft for more precise road speed control. There was just a slight change in colour choice for 1994. Honda had been producing the ultimate touring bike for the past two decades and celebrated this with the 20th Anniversary models in 1995. The Interstate, Aspencade and SE are all distinguished by commemorative gold trim, a distinctive new headlight signature and other styling treatments. All models now have the same lower seat height and a sporty new suspension. Between 1996 and 2000, the GL1500s continued to have minor changes that enhanced appearance and operation. The seat was refined for more comfort. The driving lights and turning lights received modifications and the exhaust system was fitted with triple-tip diffusers. Other changes were a redesigned engine guard, front wheel covers and additional slots in the front brake cover. New logo and emblems were fitted and colour options sometimes varied. Turning the calendar back to 1993, saw Honda engineer Masanori Aoki accept the challenge of creating the next generation (5th) of Gold Wings that would inject excitement in luxury touring. The vision was for a revolutionary (not evolutionary) design that would make use of the latest technology to produce a Gold Wing that would entice a new generation of Wing riders, whilst still satisfying the current owners’ expectations. After much research, work officially began in earnest in February 1996. In 1997 a 1657 cc engine was being tested. And so, with engines of up to 2 litres capacity being developed, it was not until April 1999 that customer preference helped to settle on 1832 cc as the most suitable size. From an appearance standpoint, the machine was to be a sporty tourer with a modern trend of having some of the high-tech frame exposed. The new millennium saw the introduction of the new Gold Wing. In 2001 the GL1800 was in the showrooms, it offered a liquid cooled horizontally opposed six-cylinder engine with fuel injection, five-speed gearbox and electric reverse, an aluminium, hand-welded spar frame with a single-sided rear swing arm and a fully linked braking system. Cruise control, intercom and stereo radio are standard with CB radio. CD player and ABS braking are extras. Other features are adjustable brake and clutch leavers, a 30-litre fuel tank and a remote transmitter for locking the luggage system. A Cycle World road test showed a 12,34 second quarter mile and a top speed of 203 km/h. In 2006, Honda developed the world’s first Motorcycle Airbag System for mass-produced motorcycles to mitigate rider injury in frontal collisions. This Motorcycle Airbag System was first equipped on the Gold Wing released in the US in the middle of 2006. The airbag featured on the GL1800 deploys in an extremely short period, and by absorbing kinetic energy of the rider’s forward movement and reducing the velocity at which the rider separates from the motorcycle, the airbag lessens the severity of injuries sustained, if they collide with another vehicle, another object or the ground. For the 2007 and 2008 models, Honda released machines equipped with airbags and navigation systems in Japan, Europe and other regions. For the North American specification 2009 model, Honda adopted the Tire Pressure Monitoring System (TPMS) to monitor tire air pressure and inform the rider when it is low, along with an XM radio to allow satellite reception of digital music, traffic information and weather reports. For the 2012 model, the production base was moved to the Kumamoto factory in Japan, and together with new styling, Honda equipped the Gold Wing with a complete set of equipment, including USB (MP3/WMA music files)/iPod-compatible digital audio and Navi PC Link. The 2015 model year, marked the 40th anniversary of the Gold Wing. The 2016 model’s travel-oriented credits include the latest generation of sophisticated electronic amenities, starting with an innovative user-friendly navigation system with the capability to share favourite ride routes with friends and other riders. It also incorporates a new built-in MP3/iPod® interface and a SRS CS Auto™ technology surround-sound system for a premium listening experience. In addition, optional features ranging from Navi, ABS and the world’s first motorcycle airbag, do much to further the Gold Wing’s reputation as the most celebrated two-up machine in motorcycle history. Features of the 2016 Gold Wing, include MP3/iPod connectivity plus access to the device functions through handlebar controls; surround-sound system; 80-watt-per-channel power amplifier; six-element speaker system; five-position heated grips for cold-weather riding; five-position heated seat/backrest combination; foot-warming system channels engine-heated air over the rider’s feet and is controlled by a fairing-mounted lever; urethane seat material and cover material; TPMS monitors pressure in both tires while riding; slow-speed, electric reverse system; lightweight electronic cruise-control system; windscreen-adjustment system provides six settings; fresh styling cues produce a more integrated appearance along with a sporting edge; fairing adds extra wind protection; adjustable and closeable windscreen vent; total of more than 150 liters of storage space between trunk, saddlebags and fairing pockets; remote-control key lock, permitting pop-open rear trunk operation; remote lock/unlock for the trunk and saddlebags; horn-actuated bike locator; instrument displays for speedometer, tachometer, coolant temperature and fuel level, plus adjustable back-lighting and high-luminescence white pointers; motorised headlight-aiming system; large 6,6-gallon (25 litres) fuel tank houses the PGM-FI fuel pump and provides excellent long-distance cruising range. There are two main flavours of the 2018 Honda Gold Wing. The Gold Wing Tour is the flagship model, with a trunk that integrates a passenger backrest and armrests. The standard Gold Wing is a replacement for the F6B Bagger. The motor is still a flat-six and now displaces 1833 cc. Efficiency is the name of the game. The new Gold Wing motor now has four valves per cylinder instead of two, and a Unicam top end. Additionally, the bore has been reduced by one millimetre and the stroke lengthened by two millimetres. This makes it a perfectly square motor, with both the bore and stroke measuring 73 mm. The crankshaft and intake system are also redesigned, and a reduction in the space between cylinders results in a more compact engine unit by over an inch. Overall weight of the motor is down more than eight pounds. Along with the motor redesign, the 2018 Honda Gold Wing gets a new transmission. The DCT transmission is a seven-speed unit, while the standard manual transmission is bumped up to a hugely improved six-speed design. The motor has four modes that interact with other functions on the Gold Wing. Yes, full electronics have come to the Honda Gold Wing family, including traction control and, on the Gold Wing Tour only, electronically adjusted suspension. As before, ABS and linked braking are standard. Tour mode is the default mode. Every time you turn on the bike, you’ll find yourself in Tour mode. It has standard throttle response, moderate DCT shift points, high traction control, and smooth suspension settings. Sport mode is for making time. You get a more aggressive throttle response, less traction control, late DCT shifting, and firmer suspension settings. Econ mode saves you money. The throttle response is reduced, and the DCT upshifts as early as possible to keep engine speeds low. The suspension is softened up, and traction control is on high. Rain mode is for low-traction situations. For roads with less than optimal traction, for whatever reason, the settings are even softer versions of Econ. The motor will rev more slowly, traction control is at its most intrusive, and the DCT shifts even earlier. The front suspension is now a double-wishbone design. With the shorter motor, Honda moved it forward in the chassis to get more weight on the front end for better feel and more stability. The double-wishbone design allows the front wheel to be closer to the motor, as it arcs upward, rather than diagonally rearward. Honda claims a 30 percent reduction of shock to the rider from the road, as well as a 40 percent reduction in front-end inertial mass, for easier handlebar movement. Bearings are used to keep the suspension action supple, and a Showa shock is employed. With the new motor and suspension, there is also a new frame and much less weight. The design is similar to before, but with a reworking of the flexing and rigid portions of the frame to match the other changes. The new frame is just over four pounds lighter, and the entire Gold Wing platform drops about 90 pounds. There is a new fairing on the 2018 Honda Gold Wing, and it is more aerodynamic. Honda claims an 11,8 percent reduction in drag. The windshield is now electronically adjustable, and it does so seamlessly. When you turn the motorcycle off, it drops down to the lowest position, but returns to where you want it when you restart the bike. The rider is also closer to the windshield, which allowed Honda to reduce its size, yet offer more protection. The new Gold Wing is very parking lot-friendly, if you get DCT. The DCT has a Walking Mode that limits the speed to 1.1 m/ph and softens the clutch engagement. It also allows you to back up at up to 0.75 m/ph. Rather than using the throttle, this is accomplished via the DCT manual shift switches. Total cargo capacity (Tour model) of 110 litres, is down from 150 litres, but the 2018 Honda Gold Wing still has generous room. The saddlebags hold 30 litres each, while the Tour trunk swallows up 50 litres, including two full-face helmets. Fuel capacity is reduced to 5.5 gallons. However, Honda claims that improved gas mileage results in an unchanged total range. There are two versions of the standard Gold Wing. You can get the Bagger with the six-speed manual transmission, or the seven-speed DCT. Your choice of colours is Candy Ardent Red, Matte Majestic Silver, or Pearl Stallion Brown. 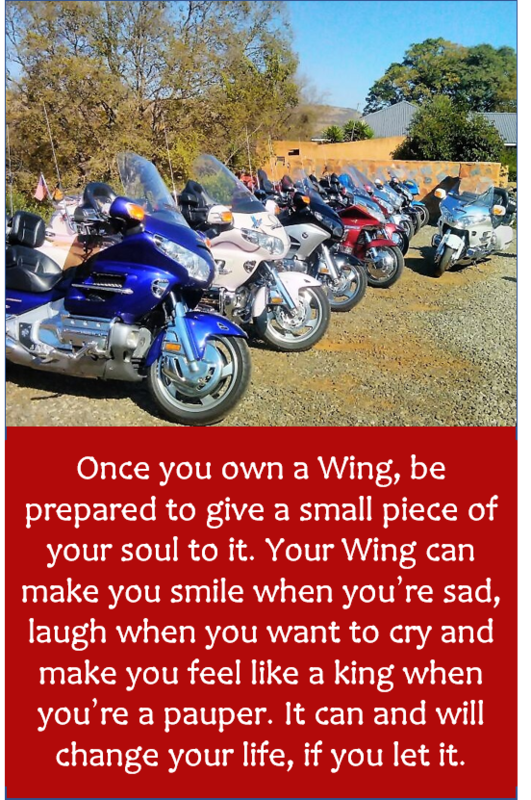 You can choose from three versions of the Gold Wing Tour. There’s the standard DCT, and an upgrade gets you an airbag. The six-speed manual version does not allow for an airbag. The Gold Wing Tour DCT Airbag is only available in Candy Ardent Red/Black. The other two Tour models come in your choice of Candy Ardent Red, Pearl White, or Pearl Hawkseye Blue. The Honda Valkyrie is a motorcycle that was manufactured by Honda from 1996 to 2003. It was designated GL1500C in the US market and F6C (“Flat Six Custom”) in other markets. The Valkyrie engine is a 1 520 cubic centimetres (93 cu inch) liquid-cooled, horizontally opposed flat-six engine transplanted from Honda’s Gold Wing model, unlike the V-twin engine commonly found on “cruiser” style motorcycles. In its transplant from the Gold Wing, the most notable engine changes were the camshaft and the change to six individual 28 mm carburettors, one for each cylinder, changes which increased power and torque. The Valkyrie was offered with a reverse gear in Japan. The Valkyrie was made in the USA at the Honda motorcycle plant in Marysville, Ohio. On introduction in 1997, a naked Standard and later, a Tourer model were offered. The Tourer included a windshield and lockable hard saddlebags. In 1999, the Interstate model was added to the lineup, which included a fork-mounted fairing along with a larger capacity fuel tank and a trunk at the rear of the motorcycle. As sales eventually dwindled, the Interstate and Tourer models were dropped after 2001, leaving only the Standard model remaining. 2003 saw the Standard offered only in black and was the last year of the original Valkyrie. Perfect for everything from weekday commutes to weekend adventures, the Silver Wing has plenty to brag about: Full-coverage bodywork. A generous windscreen. And a large, comfortable seat with room for two. Best of all, there’s the Silver Wing’s powerful 582cc two-cylinder engine with liquid cooling and fuel injection. Throw in the Silver Wing’s no-hassle V-Matic automatic transmission and Anti-lock Brake System (ABS), and you can see that with a Honda Silver Wing, you’re going to arrive in style. Sold from 2002 to 2013, the 600 cc Silver Wing (FSC600) was by far Honda’s largest scooter offering. Prior to the Silver Wing, Honda’s largest scooter had been 250 cc (Elite 250, Helix, Reflex). The Silver Wing was the second full size maxi-scooter introduced in the USA (after Aprilia’s Atlantic 500), with Suzuki’s landmark Burgman scooter arriving a year later. Unsurprisingly, the Silver Wing was Honda’s fastest scooter ever, with a 0-60 m/ph time of 8 seconds and a top speed of 105 m/ph (170 km/h). To achieve this, Honda designed their impressive 582 cc parallel twin cylinder ‘DACT’ engine. This compact workhorse put out 49.6 HP @ 7500 RPM and enjoyed an array of fancy technology. The Silver Wing employed 4-valves per cylinder, liquid cooling and Honda’s PGM-Fi fuel injection. The Silver Wing’s DACT motor also used dual counterweights to balance the engine and reduce vibrations. The CVT found the Silver Wing was also impressive in that it has three different acceleration modes that it uses, depending on how far the throttle is pressed. These modes eliminate wheelspin off the line and they improve fuel economy when power is not needed. The downside to an engine this large, is the serious fuel economy hit, compared to smaller scooters. Honda’s 250 cc scooters commonly achieve 60 to 65 mpg, but the Silver Wing can only attain a meagre (by scooter standards) 40 to 50 mpg. Normally buyers of maxi-scooters are not buying for the same reasons, so the Silver Wing is likely purchased more for touring capabilities. On the open road, the Silver Wing does quite well. It has great brakes with discs front and rear, ABS (standard as of 2011, optional before that) and CBS (essentially linked brakes so the left lever pulls both calipers). The Silver Wing also has an impressive 55 litre (15 gallon) storage area under the seat that is capable of swallowing two full face helmets. Additionally, Honda has provided dual lockable cubbyholes in the dash. One of the most important considerations for a maxi-scooter is rider comfort and the Silver Wing does quite well in this regard. The seat is very comfortable for the driver and reasonably comfy for a passenger. The passenger seat does not equal that of a Gold Wing, but it is reasonable. The rear seat backrest is adjustable for the passenger and works well for its size. Once you are rolling, the Silver Wing is generally viewed as a very stable and agile bike. At higher speeds, the FSC600 offers decent wind protection and a more comforting ride than most smaller scooters offer. This scooter also includes both a center stand and a side stand. It is easy to see why the Silver Wing was so successful as a maxi-scooter. It was sold for a total of 12 years with barely any changes.